1891: the Village Board created a “Police Magistrate” who was endowed with the power of arrest and other official acts, and the office of Village Constable and such special police force or officers as required. The early duties of the Village Constable included lighting lamps in the Village, caring for Village Hall, and building a fire in the firehouse to keep it warm. 1892: Village of Bartlett Police Department. Was established. The officers worked from 10 p.m. until 5 a.m.
1895: first lock-up facility was constructed and iron cell doors were purchased. These cell doors were in use until August 1992, when the Department moved to its current facility. 1902: duties included taking the dog census, collecting license fees and the posting of quarantine signs in 1908 to stop the spread of scarlet fever. 1931: a “watchman” was hired with the understanding that merchants would pay for any services he performed for them. This watchman wore a star and possessed police powers of preserving the peace and apprehending criminals. 1939: a siren was purchased and mounted on a truck that served as the police car. 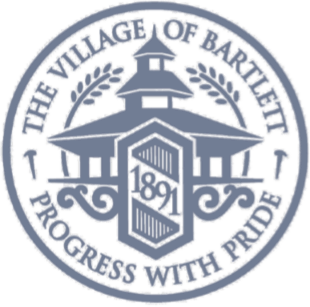 1953: the Village purchased 1 red light, 1 siren, 6 side panel identifications for the police cars and the first 4 speed signs were placed in Bartlett. 1953 also saw the first full time Police Officer hired, a work day for the officer included answering police calls, school crossing guard duties, running radar, keeping records, maintaining vehicles, and cleaning the Village Hall for meetings. 1958: plans were made for installing a radio in the police car and the Village purchased a revolving red light and two handguns for use by the Auxiliary Police who served as the police force. 1961: the Village purchased a radar timer that was mounted in the police car. In response to a petition from citizens regarding traffic control, a traffic officer was stationed on Oak Street to direct rush hour traffic. 1963: the Chief was required to work from 8:30 a.m. until 4:30 p.m. Emergency calls for service were sent to the Chief’s house when the station was closed, the Chief would turn his porch light on to notify the officer on duty there was a call and the officer would stop to obtain information and respond to the call. 1970: five full time officers and the Village saw a rise in its workload. In November, the “Night Watchman” program that began in 1931 was formally ended. 1975: Village Board created the Fire and Police Commission and in September of that year signed an agreement to join the regional dispatch center known as DuComm. 1976: position of Parking Enforcement Officer was created and the first examination for Police Officer was held. 1978: six more squad cars were added; officers who lived in town could take their squad car home at night. 1979: creation of the Community Service Officer program. We left the DuComm dispatch system and began handling our own dispatching. We shared a frequency with the Streamwood Police until 1981, when Bartlett returned to DuComm. 1980: The Police Station was open 24 hours a day and the officers no longer took home the squad cars. 1989: Mobile Data Terminals were installed in squad cars, allowing officers to receive dispatch tickets over the computer and achieve better call response time. We began teaching the D.A.R.E. program in local elementary schools. 1992: police staff moved into a new building allowing an expansion of services provided to citizens as well as state-of-the-art working conditions for employees. 1996: Bartlett’s first K9 “Bart” joined the force and worked until his retirement in 2005. 1997: we received national accreditation status from the Commission on Accreditation of Law Enforcement Agencies. 1999: Bartlett put its Emergency Operation Center into action for the first time on New Year’s Eve in anticipation of potential Y2K problems. Although the night was uneventful and no problems were reported, it provided a “functional exercise” of the Village’s Emergency Operations Plan. 2017: the department consists of 1 Chief of Police, 2 Deputy Chiefs, 3 Commanders, 7 Sergeants, 1 Civilian Supervisor, 41 Officers, 17 full-time and 3 part-time civilian personnel. This has allowed the creation of a number of programs that benefit the community and the department.